Every year or so I ask my newsletter subscribers to take part in a survey. It’s a little bit of fun that helps me get to know readers a little better and find out what you’d like to see in the future on The Creative Photographer. 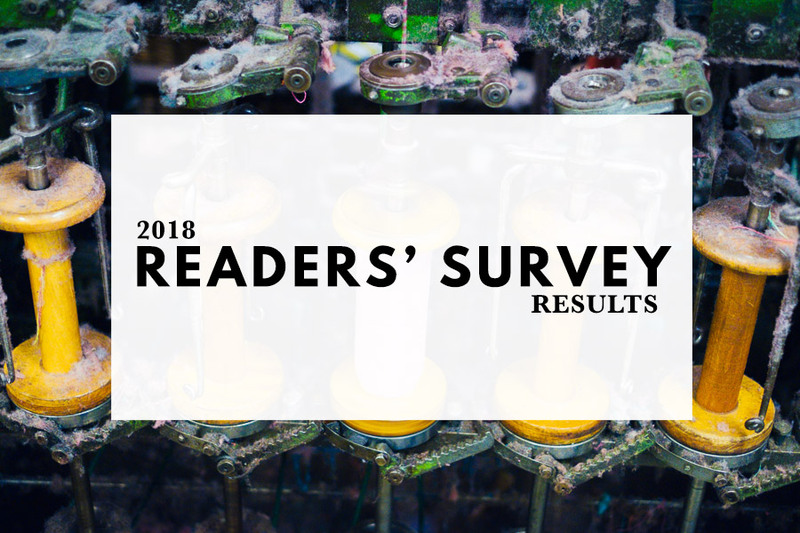 This year’s survey asked what content you’d like to see on the website and what photography workshops you might be interested in. In total, 264 people responded. 1: Which age group do you fit in? Of the people who responded to the survey it turns out that over 94% of you are over 46, and over 81% over 55. Which raises the question, where are all the young people? Hopefully they are out taking photos rather than responding to surveys! 2. Which category best describes the sort of photographer you are? No surprises here – most of you describe yourselves as advanced enthusiasts. 3. 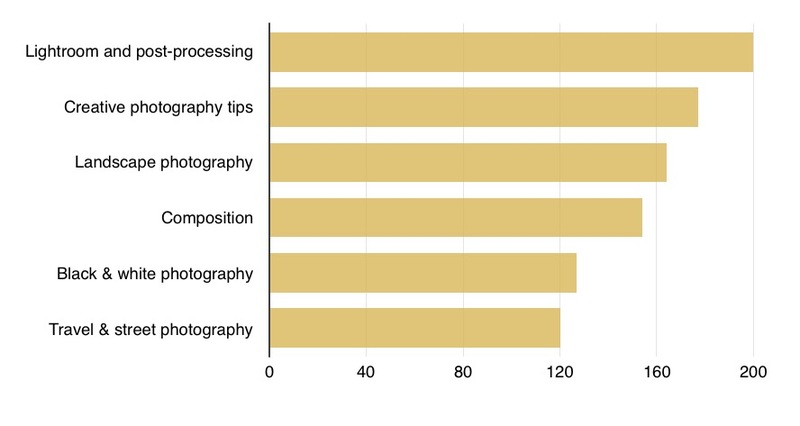 Which topics do you enjoy reading about most on The Creative Photographer? 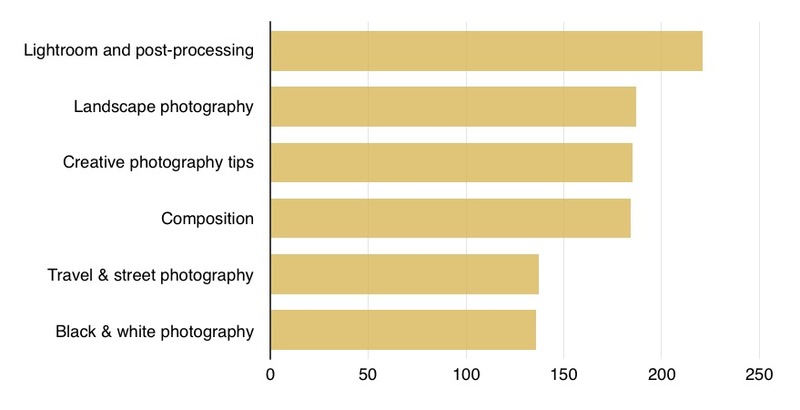 Lightroom and post-processing are the most popular articles on the website, followed closely by landscape photography, creative photography tips and composition. 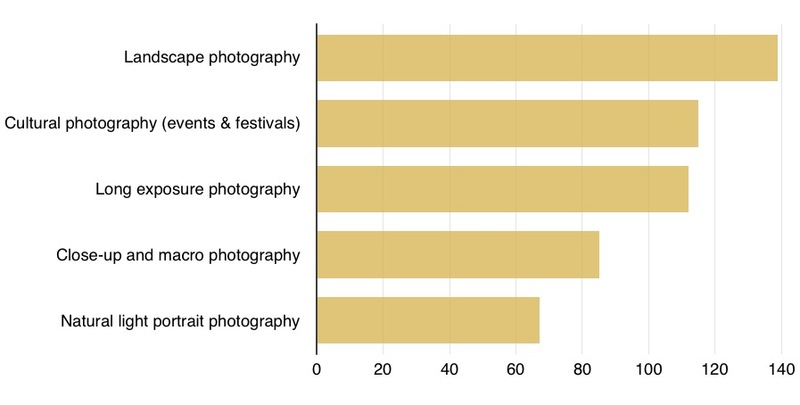 The least popular category was web design for photographers, with just 24 votes. 4. Which subjects would you like us to write about in the future? 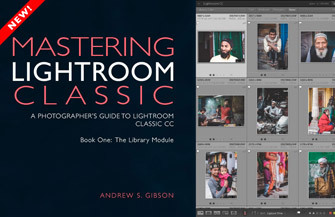 Lightroom and post-processing is the winner again. 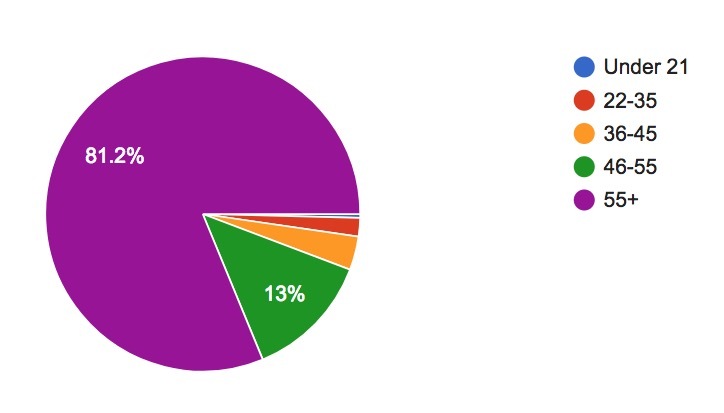 The least popular was web design for photographers, with 34 votes. 5. We’re looking into organizing photography workshops in the UK, Europe and Asia. Which of these workshop formats would you be interested in? South-west England and Western Europe were the most popular choices. Some people suggested locations such as Canada, the United States, Australia and New Zealand. 6. What locations or countries would you like to attend photography workshops in? 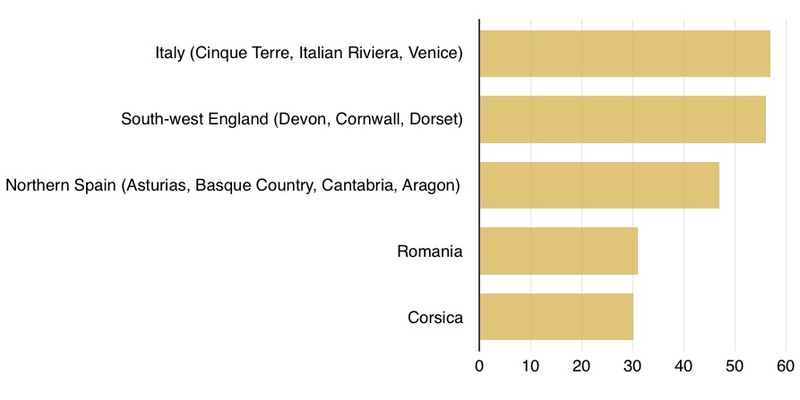 Italy was the winner, closely followed by South-west England and northern Spain. The popularity of northern Spain surprised me as I didn’t think it was well known as a potential workshop destination. 7. What would you like to learn on a photography workshop? Landscape photography was the clear winner here. Drone photography was the least popular option, with just 18 votes. I also asked readers for suggestions of other photographers they would like to work with, and for content suggestions for the website. There were a lot of useful answers – I’ve read every response and made lots of notes. Thank you everybody who contributed! Interesting to see the survey results and have to admit to being in that 81% group, but then we do have more time to take pictures. Great to see that folks would attend a workshop in Italy (it’s where we live and photograph) And I admit to wanting an excuse to visit Cinque Terre. Had some good times in Venice and the Veneto (Po Valley etc.). Last year a few days in Ferrara was most productive. Hope we may meet up some time. Hi Peter, yes it’s no surprise that Italy is a popular destination, the beauty of its towns and villages are well known. Would love to lead some workshops there one day. iMacs are great, aren’t they? I have no complaints about mine.